Caption slip reads: "Photographer: Miller. Date: 1957-05-20. Reporter: Adler. Assignment: Sewer line. 5/6: Shot of 22-inch sewer sludge outfall pipe, looking from near end, where it goes into ocean, toward shore and Hyperion Treatment Plant. 105/106, l to r: Workmen Les Bennett and Tom McGuire signaling go-ahead for pulling of first sewer line section into ocean -- note line disappearing in water. 15/16: Shot of welding two 600-foot sewer pipe sections together to be pulled into ocean. 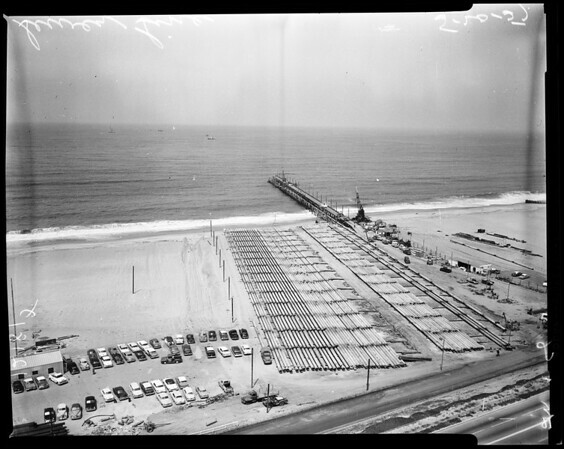 Various shots taken from helicopter, showing pier with pipe alongside barge from which pipe is being pulled, and coast line with Hyperion Sewage Treatment plant".